A Hyperloop is a new type of train that travels at very high speeds. The reason it can travel so fast is because it is inside a tube with no air. The lack of air means that there is no friction to slow the train. The Hyperloop is being created and tested in various places around the world including the United States, the Middle East and Asia. In 2012, Elon Musk (Tesla Motors, SpaceX) talked about this technology. 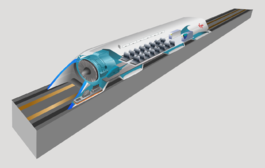 In 2013, he put a plan online that showed the hyperloop train traveling between San Francisco and Los Angeles in the United States. He shared the technology with the world. In 2015, Musk's company built a 1.6 kilometres (0.99 miles) test tube. He asked universities and companies to make the test trains. They had two competitions in 2017 to see how fast the hyperloop trains could travel. The fastest test was 324 kilometres per hour (201 miles per hour). The hyperloop will be faster than cars, buses and regular trains. Elon Musk suggests that it may be possible to travel over 700 kilometres per hour. The hyperloop will be environmentally friendly compared to a lot of current transportation. Most plans for building the hyperloop use solar power to run the system. Because the hyperloop trains run inside of a tube, they will not be affected by weather such as snow or fog. Building costs will probably be very high. It is predicted that the Los Angeles to San Fransisco hyperloop would cost between 6 and 7.5 billion to build. Passengers will not be able to move while the hyperloop is traveling. This means that there will be no access to toilets during trips. This page was last changed on 2 December 2018, at 00:23.